qPCR kinetics of 2-LTRc and integrated DNA forms during a single round of HIV replication in the presence of inhibitors. MT4cells were infected with HIV-1 in the absence (DMSO) or in the presence of 100 nM EFV, 500 nM RAL, 500 nM DTG, 10 μM RDS1611, 10 μM RDS1644, 10 μM RDS1823 added at the time of infection (black bar) or 16 h p.i. (grey bar). Samples were analyzed for (A) total viral DNA at 24 h and (B) 2-LTRc and (C) integrated viral DNA at 48 h. The graph represents the average and standard deviation of three independent experiments. Significant at: p value < 0.05 (*); p value < 0.01 (**); p value < 0.001 (***); p value < 0.0001 (****). Antiviral Res, 2016, 134:236-243. Dolutegravir (GSK1349572) purchased from Selleck. Comparison of the activity of dolutegravir (DTG), raltegravir (RAL), and elvitegravir (EVG) against wild-type HIV-2ROD9. The number of independent determinations (n) for each strain is shown below the x-axis. No cytotoxic effects were observed in dolutegravir-treated MAGIC-5A cultures at concentrations as high as 10,000 nM. 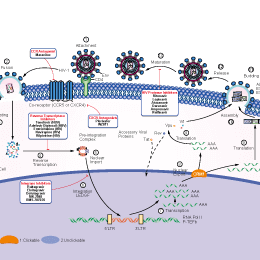 Retrovirology, 2015, 10.1186/s12977-015-0146-8. Dolutegravir (GSK1349572) purchased from Selleck. Strand transfer was carried out with RSV IN(1-269) (4 uM) and GU320R(2 uM)in the presence of 50mM NDSB201. Increasing concentrations of STIs were added as indicated at the top; DTG(Dolutegravir) in lanes 3-5, MK-2048 in lanes 6-8, and RAL in lanes 9-11. No STI was present in lane 2, and lane 1 contains the molecular weight markers. Strand transfer products and ODN substrate are identified on the right. CHS, circular half-site; OC target and SC target, open circular and supercoiled target DNA, respectively. J Biol Chem 2014 289(28), 19648-58. Dolutegravir (GSK1349572) purchased from Selleck. 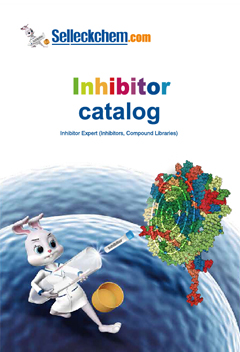 A next-generation and two-metal-binding HIV integrase strand transfer inhibitor. The inhibitory potencies of S/GSK1349572 and other INIs are measured in a strand transfer assay using recombinant HIV integrase. A complex of integrase and biotinylated preprocessed donor DNA-streptavidin-coated Acintillation proximity assay (SPA) beads is formed by incubating 2 μM purified recombinant integrase with 0.66 μM biotinylated donor DNA-4 mg/mL streptavidin-coated SPA beads in 25 mM sodium morpholinepropanesulfonic acid (MOPS) (pH 7.2), 23 mM NaCl, and 10 mM MgCl2 for 5 minutes at 37 °C. These beads are spun down and preincubated with diluted INIs for 60 minutes at 37 °C. Then a 3H-labeled target DNA substrate is added to give a final concentration of 7 nM substrate, and the strand transfer reaction mixture is incubated at 37 °C for 25 to 45 minutes, which allows for a linear increase in the strand transfer of donor DNA to radiolabeled target DNA. The signal is read using a Wallac MicroBeta scintillation plate reader. MT-4 cells growing exponentially at a density of 500000 or 600000 /mL are infected with HIV-1 strain IIIB at a viral multiplicity of infection of 0.001 or a 50% tissue culture infective dose of 4 to 10. The cells are then aliquoted to 96-well plates in the presence of varying concentrations of S/GSK1349572. After incubation for 4 or 5 days, antiviral activity is determined by a cell viability assay that either measured bioluminescence with a CellTiter-Glo luminescent reagent or measured absorbance at 560 and 690 nm using the yellow tetrazolium MTT reagent [3-(4,5-dimethyl-2-thiazolyl)-2,5-diphenyltetrazolium bromide]. Kobayashi M, et al. Antimicrob Agents Chemother. 2011, 55(2), 813-821.